First plan your workouts, get motivated, and evaluate your exercise equipment needs. Then you're off and running (or rather, lifting) and getting stronger! First off, schedule your workouts. 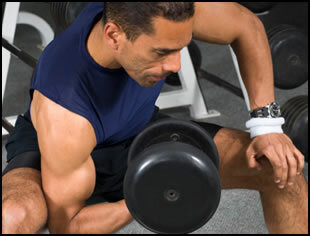 A regular weight training frequency is essential. Just because you're at home doesn't mean you'll always, "Just get to it later..."
Turn on some music at home that pumps you up! A movie soundtrack, your favorite CD, Eye of the Tiger, or Beethoven's Fifth - Whatever it takes to get you ready to go! Get a buddy who's also exercising at home and compare notes. You'll keep each other motivated, and you can each give the other one a hard time for slacking off. Promise yourself that if you workout for a week, you'll buy yourself something special. To eat, to wear, to juggle, whatever. Give yourself something to look forward to. In the beginning, NO! Elaborate home weight lifting equipment isn't what you need if you're just starting out. If you've been working out regularly before and have done some workouts at home, then you can take the plunge. But if you're new to working out as well as to weight lifting at home, then you don't know if it's your thing yet. Instead, work out for a few weeks at home doing body-weight workouts, jogging around your neighborhood, or borrowing a friend or neighbor's weights. Finding someone with weights and borrowing them (the weights, not the person) for a few weeks is the best way to do this. That way, you can find out if exercising at home is something that you can fit into your schedule & have the motivation for. So you won't have guilt or dust gathering on your home exercise weight-sets. You'll know you have the drive to do weight training and any money you spend on weights will be an investment in you body and not just your home decor. Have a short term, measurable goal when you first start weight training at home. Give your workouts at home a good, honest trial for a short time and see how it works out. Commit to doing your workouts for just 1 month, or 30 days. That's enough time to find out whether lifting at home is your thing, or not. And enough time to make real progress! And it feels great hitting any goal, large or small. So, look around and choose how you want to start your weight training at home. Find a friend to borrow weights from (or just some heavy stuff around the house), and get going! • Click here to leave 'Weight Training at Home' & go back to the Home-page!